Like people who casually assess similarity between spatial scenes in their routine activities, users of pictorial databases are often interested in retrieving scenes that are similar to a given scene, and ranking them according to degrees of their match. For example, a town architect would like to query a database for the towns that have a landscape similar to the landscape of the site of a planned town. 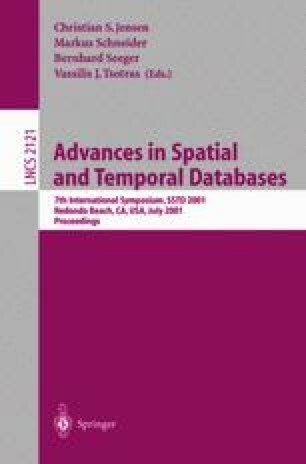 In this paper, we develop a computational model to determine the directional similarity between extended spatial objects, which forms a foundation for meaningful spatial similarity operators. The model is based on the direction-relation matrix. We derive how the similarity assessment of two direction-relation matrices corresponds to determining the least cost for transforming one direction-relation matrix into another. Using the transportation algorithm, the cost can be determined efficiently for pairs of arbitrary direction-relation matrices. The similarity values are evaluated empirically with several types of movements that create increasingly less similar direction relations. The tests confirm the cognitive plausibility of the similarity model. This work was partially supported by the National Imagery and Mapping Agency under grant number NMA202-97-1-1023. Max Egenhofer’s research is further supported by the National Science Foundation under grant numbers IRI-9613646, US-9970123, and EPS-9983432; by the National Imagery and Mapping Agency under grant NMA201-00-1-2009; by the National Institute of Environmental Health Sciences, NIH, under grant number 1 R 01 ES09816-01, and by a contract with Lockheed Martin M&DS.